Bill Windsor filed a stinging motion today to disqualify Judge James A. Haynes in the Missoula Montana Criminal Trial DC-14-509 -- State of Montana vs. Senior Citizen known as The World's Most Notorious Tweeter. It's May 13,2015 -- 5:00 pm Mountain Time. William M. Windsor is a very neat guy -- except for in and around his desk. This photo hides the real mess. Bill Windsor was thrown for a complete, total loop this morning when he received a package that included some critical court filings dated April 23, 2015. He mailed them from the Missoula County Detention Center where the mail person adds the postage and takes money off your books. The filings never reached the Clerk of the Court. So, he jumped on the phone to the Clerk, scanned five documents, and the Clerk agreed to accept them by email. What a nightmare. Just another of the violations of your Constitutional rights when you are forced to be at the mercy of folks who are paid to keep you locked up, not paid to care. As soon as he finished, it was a race to the post office to get the originals in overnight mail, though overnight mail and next day UPS take TWO (2) days when you are at the end of nowhere in Misserableoula Montana. Then another race down to the Missoula County Courthouse to get three filings made. The biggie was the Second Motion to Disqualify Judge James A. Haynes. Now Judge James A. Haynes is not going to like this. Bill Windsor tells it like it is. Judges don't like that. They HATE guys who aren't afraid of them. It's generally a good idea to not piss off your judge, but Bill Windsor comes from a different place on this. When the judge is corrupt, he tackles it head on. If you don't know the story, you will be amazed that many of the same things that happened to Bill Windsor in Montana happened four years earlier to whistleblower Crystal Cox. Same people. Same words in orders. Same protection of Sean Boushie. Same corrupt acts. But only Bill Windsor got to spend 134 days in The Slammer. And only Bill Windsor gets to stand trial on five alleged crimes. But Crystal Cox has had plenty of excitement of her own, and she set a major court precedent. Now it's Bill's turn to find an honest judge and do the same. Crystal Cox was great to reply to Bill Windsor's email and send him some evidence for the filing. A complete story will be posted about this motion to disqualify. Judge James A. Haynes became infamous when he denied Bill Windsor's Petition for a Temporary Order of Protection after Sean Boushie attempted to murder Bill Windsor as he drove on the Interstate between Butte and Missoula. Sean Boushie even sent Bill Windsor an email taking credit for the shooting. Judge James A. Haynes denied the Petition saying that Bill Windsor did not qualify because Sean Boushie would have to first be arrested and convicted. Even Sierra, the mani-pedi lady in Missoula, knows that's hogwash. By the way, she said Bill Windsor was her first...pedicure with someone wearing a GPS Ankle Monitor. The good news is that it is filed. The good news is that Judge James A. Haynes has to step out of the case at least for now. The bad news is that one of the Montana Supreme Court justices steps in, and those guys have viiolated the law and William M. Windsor's rights even more royally than has Judge James A. Haynes. "Legal Intern Tyler Dugger claims William M. Windsor’s attitude toward courts is well-known. This must be stricken as must all alleged statements of fact as Legal Intern Tyler Dugger has not sworn to a thing. The truth is that William M. Windsor is loved by honest judges, honest law enforcement, and honest prosecutors in America because he is exposing the corruption. He is hated by the corrupt judges, corrupt law enforcement, and corrupt prosecutors. Heaven forbid that William M. Windsor believes corruption and dishonesty has no place in our judicial system or with law enforcement and that dishonest attorneys of all types should be tried for perjury and subornation of perjury. What would America come to if we actually had the rights that the Constitution and Bill of Rights claim we have? William M. Windsor respectfully submits that Legal Intern Tyler Dugger has no business being an attorney. He apparently wouldn't understand a Constitutionally-protected right if it bit him on the…. He should move right from law school into a position as a Montana judge where he will get to ignore the facts and the law and say and do whatever in the world it is that he wants, destroying lives in the process." Gee, do you think Tyler Dugger took offense to that? Well, if he did, he should try getting arrested on ridiculous charges made up by a little kid like him and spending 134 days in jail. That's something to get pithed off about, and you better believe William M. Windsor is plenty pithed. 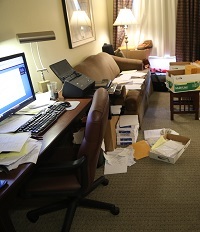 Bill Windsor is back at it, drafting more stuff to be filed tomorrow. By the way, Bill Windsor has a GPS Ankle Bracelet, but he can travel anywhere. Judge James A. Haynes has set dates that make it impossible for William M. Windsor to get the evidence that he needs from Texas, Missouri, Michigan, Georgia, and other exotic locales. A new judge may open this up for Bill to get out and get the depositions he needs. Look for the disqualification article later tonight. It makes for interesting reading. The Judicial Disqualification Center had a little helpful stuff.